Former PM Atal Bihari Vajpayee passed away on Thursday evening. Topbrass Politicians, Industrialists and Film Celebs have been paying last respects to the statesman. Actually, Vajpayee announced retirement from Politics in 2005, a year after losing power to the Congress Party. He suffered a cardiac arrest in 2009 and stayed away from media glare ever since then. None of the media personalities were able to either photograph him or obtain his interview. 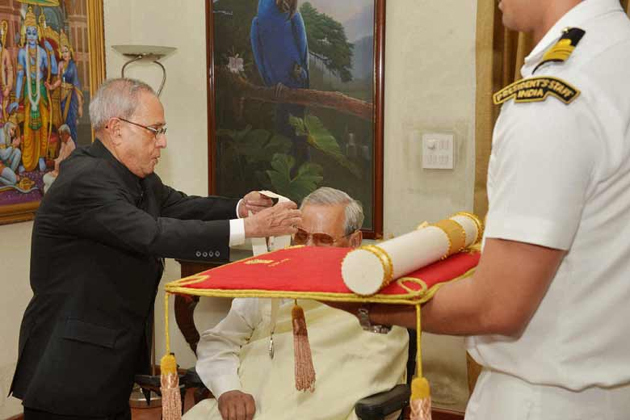 In 2015, NDA Government awarded Bharat Ratna, highest civilian honour, to Atal Bihari Vajpayee. That's when then President Pranab Mukherjee and PM Narendra Modi went all the way to his residence at Krishna Menon Marg in 2015 to present it. Not even a single journalist was allowed to capture the rare moment. Rashtrapati Bhavan released only one photograph in which the BJP Patriarch's face was covered intentionally. That picture of the Ex-PM has gone viral after his demise. Is This Why KCR Is Keen For Early Polls?